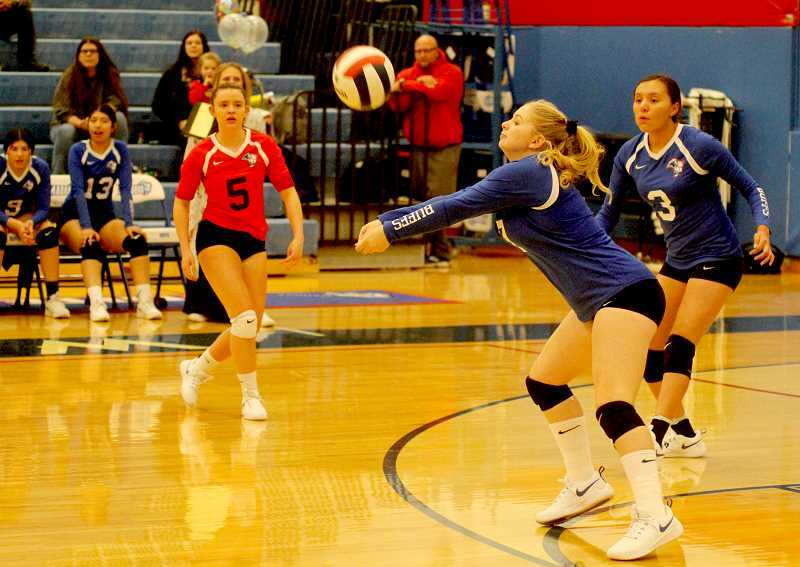 Madras White Buffalo volleyball program loses final two games of the regular season. The shorthanded Madras White Buffalos volleyball team lost their two final games of the season. The Buffs lost to Molalla on Oct. 15, in three sets, 25-15, 25-7, 25-5, and also lost a home game to Estacada on Oct. 17. Madras lost all three sets, 25-11, 25-16, 25-12. Even though the White Buffalos did not end the season the way they wanted, the team still improved leaps and bounds from the previous year. The White Buffalos finished the 2016-17 year with only two wins the entire year and since the 2014 season, the Madras volleyball program had a total overall record of 5-43. This season, the Buffs finished this year with a 7-11 overall record. The White Buffalos started the year 4-2 in their first six games. The White Buffalos played their last two games without five players, including three senior starters. "It was crazy," senior Loraija Miller said. "I wasn't thinking about the game or score. I felt a little lonely, but that is OK because I had the rest of my team here and I was just trying to have fun. This year was way better and our attitudes went up drastically. The season went well and I had fun." "I honestly could not be more proud of overall how we did," head coach Brianna Hewson said. "Last year, we had some negativity, were down, drama stuff and this year was a clean slate. We knew what we wanted to do and they stayed positive and played to the best of their ability each game." "Our freshman really bought into it and displayed it throughout the season and I am very proud," she said. "I hope they continue to stay and keep their strong bond up and when they are seniors, they should kill it." "I am very proud of our girls this year and I am hoping we can keep things rolling into next year," Hewson said. "We implemented our core values as far as HEART goes and our honor, effort, attitude, respect and teamwork." "Regardless of what happened, those five girls are irreplaceable," Hewson said. "They have been playing together for the last five or six years, so they had a bond and knew exactly what each other would do. That is not something you can teach. It comes with time."